Still close, as in previous day, last screen. FARROW looking at LIGHT. A pregnant moment. LIGHT is as before, earnest, helpful, honest. FARROW might be a little suspcious. 2. LIGHT: What my sister heard, Mister Farrow, sir. FARROW has straightened up. He’s decided. LIGHT is looking a little relieved, now that FARROW isn’t looking at him. 3. FARROW: And Payne would do it without me, would he? 4. FARROW: Take the ship and the map and leave me holding my hat in hand. 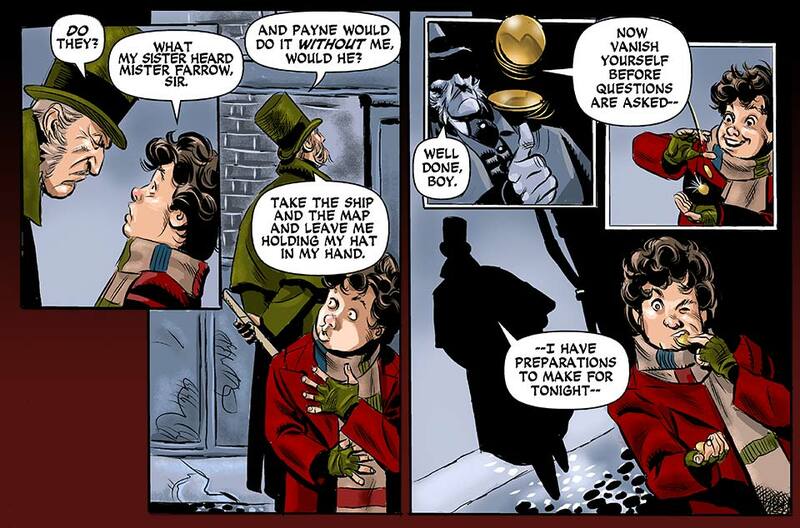 FARROW flips two gold coins to LIGHT, who catches them, surprised. 5. FARROW: Well done, boy. LIGHT watching FARROW leave the alley. 7. FARROW/small: …I have preparations to make for tonight…. On LIGHT, looking after Farrow. His expression is now quite serious. Did he buy it? 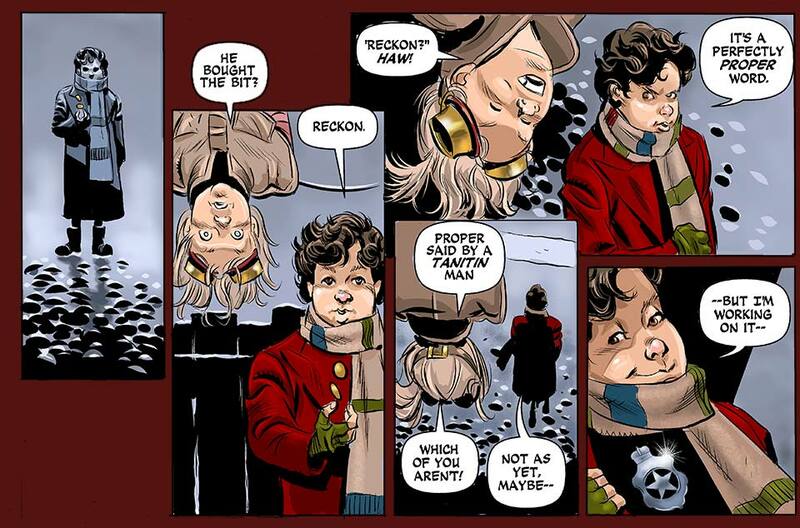 STONE is entering the panel from above, hanging upside down. 1. STONE: He bought the bit? 4. LIGHT: It’s a perfectly proper word. 5. STONE: Proper said by a Tanitin man. LIGHT turning away from STONE, a slight, secret smile. 6. STONE: Which of you aren’t! 8. LIGHT: …but I’m working on it…. 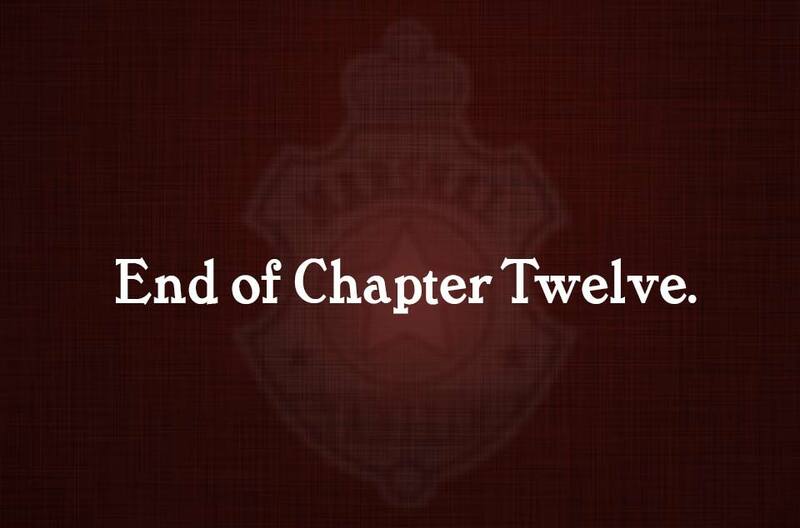 Great end to the chapter! What? End of Chapter?!! Whaaaah! Please let more come soon. I must see these plans come together! How long will this break be? The plan’s afoot. There will be no break! We’ll have a teaser on Monday and dive right in to Chapter 13 on Thursday. Hold–oh, you know. I had my reservations for the entire chapter, but I was sold on Light and Stone by that last panel. So great! Love the tag at the end. A belated welcome back! Love the illumination on the wet cobblestones in these panels, I never tire of the details. And…badge sighted! Yay!